In this android app you can control your computer remotely through Bluetooth or Wifi by creating your own customisable remote controls. The app is named as AIO Remote stands for All in one remote and is compatible to operate with windows, Linux and Mac operating systems. This application comes with a new characteristic, you can control another android phone or tablet through the customisation of this app. If you are facing any trouble with your computer mouse or keyboard of your computer, this app is the consummate answer for it. For professionals this app can use it as the remote controller for the PowerPoint presentation slide control, are you a serious gamer? Feeling difficulties with game control in computer keyboard? This app will helps you to manage game control with 8 buttons and 8 directions with multi touch support. -- You can make your own custom remotes. -- Online remote gallery section helps you to recover and install custom remotes created by the other users and likewise you can upload your project. -- Remote file manager let you browse and transfer files from mobile to your computer easily. -- You can play games from single player to 4 player with connecting 4 mobile phones installed with the AIO Remote app. -- Control media players include windows mediaplayer, mediaplayer classic, winamp, vlc etc. #3 Just connect your phone with Bluetooth/WIFI and enjoy! If you are like this article don’t forget to share with your friends and if you are facing any trouble with this app please report it in below commenting! One of the most popular torrent cloud downloader which is completely free and fast. It is easy to use and register. Zbigz is also a free torrent downloader which has a speed limit of 150 KB/s. After much await and and rumors Android 5.0, code named Lollipop is released. Lollipop is supercharged with 4 times better performance and more battery life. It will run ART as default instead of Dalvik. Another important change is the new material UI design in all popular apps. There is a completely new notification styles and key new features in interface. Currently Nexus 6 , Nexus 5 , HTC one M8 and Moto G started recieving the Lollipo update and soon will spread to most of the new devices. Motorola already announced the updates for Moto X, Moto G , Moto E etc . And also the new Android One devices will soon recieve the update. HELLO TechnoDrips readers..!!!! Peeping for Giveaways?? Here we are back again with monthly Giveaway with attractive prizes. We have already completed 2 successful giveaways with the number of winners. Today we are back again with more attractive prizes includes mobile top-up upto 200Rs+ Shopping cash voucher worth 200Rs,100Rs etc.. To our loyal blog readers. This Giveaway is sponsored by Indias First E-Mall initiative GERGstore.com from GOLDEN ERA ROYAL GROUP. It's an upcoming boom in the world of E-commerce and well set to give the customers its maximum service. Log on to gergstore.com for a better shopping and good customer service. GERGstore.com is India’s First E-mall initiative from Golden era software solutions and consultancy Pvt LTD and Golden era consumer durables private LTD. The platform enables people across the globe to access and purchase supreme quality products at a reasonable price through a virtual electronic shopping mall without the hassles of a Physical Shopping mall. In this Giveaway you have to do simple tasks like a Facebook fan page like, twitter followers, blog comment etc.. Do these tasks daily till the Giveaway ends. The contest starts from10th October 2014 at 12:00am and ends on 30th October 2014 at 12:00am. The winner will be declared on 30th October 2014 and the price will be awarded on the same date. Rush Rush and Rush to be the participant of this contest and bag the attractive prizes. Hurry!!! Don't miss your Chance win Exciting prizes! 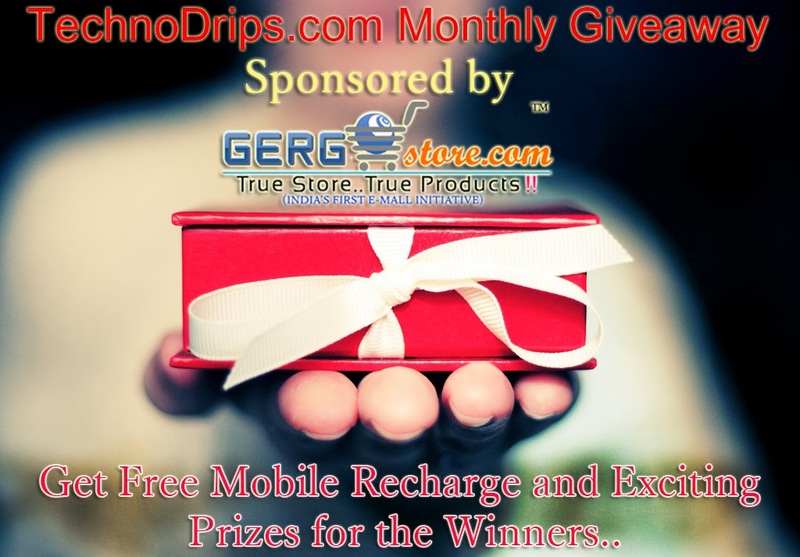 -- Go through "technodrips.com monthly giveaway" box given below and login using Facebook or E-mail. Note:- We are strictly watching in the back end, how participants are earning entry points,Only valid points will be counted. If there any point tie occurs at the end, the winner will choose randomly. Microsoft surprisingly announced its Windows 10 version on september 30 through their official blog. Many were surprised that Microsoft jumped from Windows 8 to 10, skipping 9. Only the developer version of the Windows 10 is now available for techies , and it is expected to reach the consumers by early 2015. Microsoft announces windows 10 as a universal build for all device like tablets, pc's etc and it will be a completely new experience.Now users can test the preview and give their suggestions.There can be many changes in the preview version from the final version and testers gets continuos updates. So if you use computer for you daily use , stay on it until a final version is released. Find files faster: File Explorer now displays your recent files and frequently visited folders making for finding files worked on easier. Multiple desktops: Create desktops for different purposes and projects and switch between these desktops easily..
New task view button: There’s a new task-view button on the taskbar for quick switching between open files and quick access to any desktops you create. Snap enhancements: You can now have four apps snapped on the same screen with a new quadrant layout. Everything runs in a window: Apps from the Windows Store now open in the same format that desktop apps do and can be resized and moved around, and have title bars at the top allowing for maximize, minimize, and close with a click.